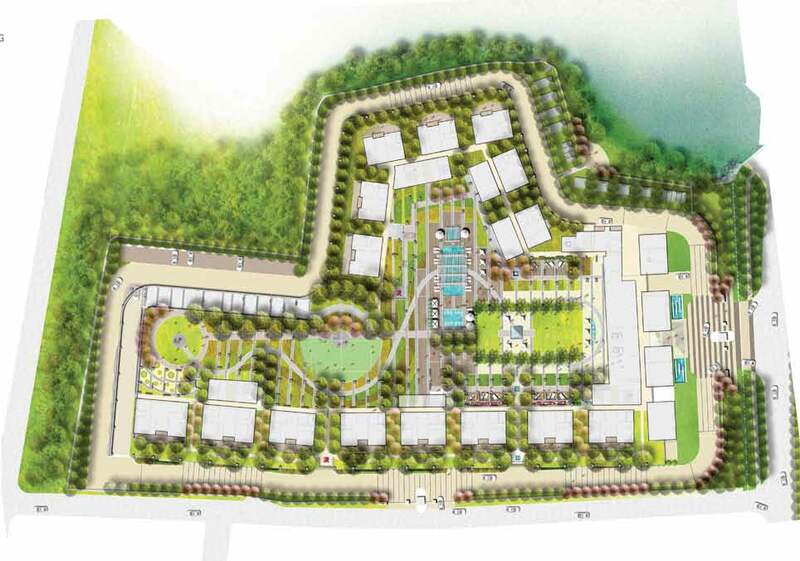 Ashok Heights – Green Space Alliance | Urban designers | Planners | Landscape Architects. GSA was retained by Peninsula Land Limited to provide landscape architectural services for a 4.5 ac site in Hyderabad, India. The development consists of 22 17 storey residential towers constructed over a raised podium with underground parking beneath. The towers are arranged around a central courtyard that incorporates a variety of landscape elements such as a swimming pool and spa, tennis and badminton courts, garden terrace, and multiple gathering spaces. Intimate open-air lounge spaces, tucked under the second storey overhangs of the building, create partially enclosed spaces protected from the elements. Streetscape design elements surrounding the site such as contrasting paving bands help to direct and calm traffic as well as indicate vehicle drop-off locations. Throughout the site, art has been incorporated into the landscape design. A contemporary metal water feature, flanking each side of the front entry, creates a prominent landmark and focal point that is reflected within the interior courtyard as a metal trellis covering a portion of the central pool. Additionally, the metal trellis offers protection from the sun while incorporating lighting for evening events.